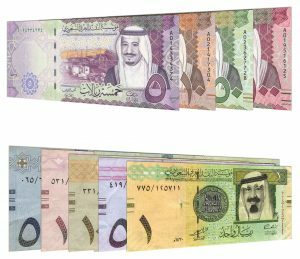 The Saudi Riyal is the currency of the Kingdom of Saudi Arabia from 1925, replacing the Hejaz riyal at par. The origin or the name ‘riyal’ is an Arabic borrowing of ‘real’, as a general name for any large silver coin from Europe. ‘Real’ means ‘royal’, referring to the king’s portrait on the currency. We exchange both current and withdrawn Saudi Riyals. Our online exchange service is quick, easy, secure and free of charge.